Last week I was on vacation down in Florida and I had a chance to tour Thomas Edison’s winter vacation home. The tour guide told us that Edison wired his house and switched on electrical lighting in 1887. Then the tour guide leaned in and quietly mentioned that it took 11 years to install lights in the rest of the town. Why so long? Because the townspeople were worried that cows would stop giving milk. For some reason, I was reminded of that anecdote as I read a recent piece in the Washington Post. Rarely do I pause in the middle of reading an article and think to myself, “Wow, I disagree with almost everything that person is saying,” but that’s what I found myself doing. Luckily you don’t need me to marshal counterpoints. Instead, I suggest that you read what Jeff Jarvis wrote, or what Mike Masnick wrote, or what the Markos Moulitsas wrote, or what Danny Sullivan wrote. Or read Timothy Karr’s post about the authors’ undisclosed potential conflicts of interest. I believe good journalism is critically important to a well-functioning society. I love newspapers, magazines, and the journalists that they support. But I disagree with Bruce Sanford and Bruce Brown, and reading their piece reminded me of those townspeople sitting in the dark, afraid to switch on their electric lights. 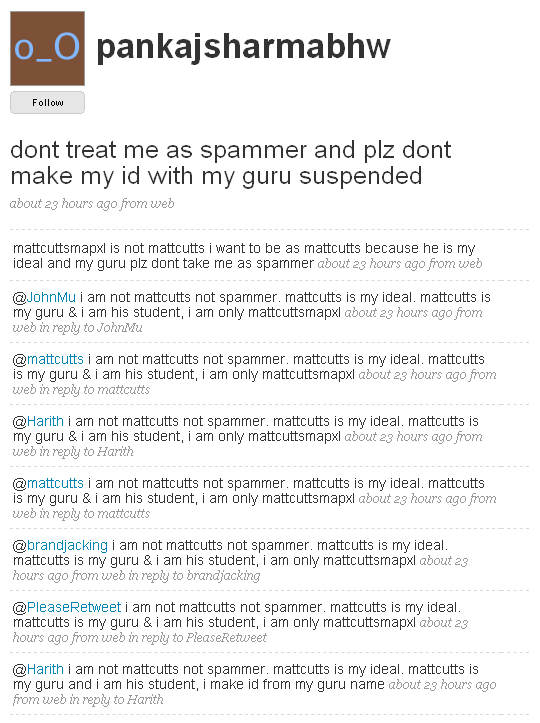 Here’s the thing: if you have to explain to everyone why you’re not a spammer, you’re doing it wrong. It’s this sort of thing that can give a field a bad name. If everyone is mad at you because you’re abusing the trust within a community, that’s uncool. And if you’re in it for the long-term, it’s better to earn a reputation on your own. That seems easier. I noticed that The Guardian drew up a list of top 100 sites for 2009. There’s a lot of great sites on their list, from stackoverflow.com to popurls.com to xkcd. 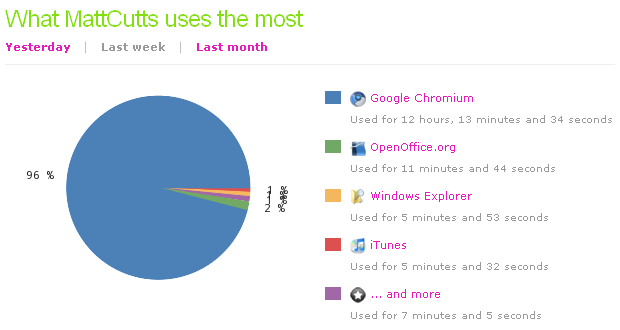 My readership data is going to be way-skewed, but I do think Google Reader is more popular than Bloglines these days. 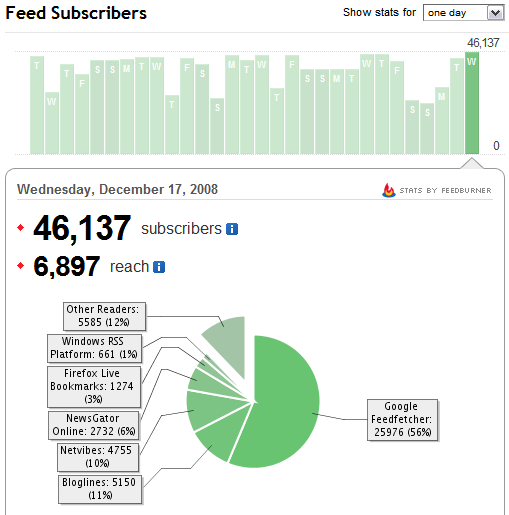 What do your FeedBurner or RSS reader stats look like? P.S. If you haven’t see Lee Odden’s post about it, Lee collected the subscriber numbers for a bunch of search-related blogs a while ago.